The National Weather Service In Shreveport Has Issued A * Flash Flood Warning For... Central Smith County In Northeastern Texas... Southern Upshur County In Northeastern Texas... Gregg County In Northeastern Texas... * Until 1230 Am Cdt. ...Read More. The National Weather Service In Fort Worth Has Issued A * Flash Flood Warning For... Eastern Henderson County In Central Texas... * Until 1145 Pm Cdt.. * At 850 Pm Cdt, Doppler Radar And Automated Rain Gauges Indicated Thunderstorms Producing Heavy Rain Across The Warned Area. Four To ...Read More. PALESTINE – On May 5, an election for the Palestine City Council Position Five was held by the City of Palestine and featured political newcomer Dana Goolsby taking on incumbent Doug Smith. In an unusual occurrence, after the polls were closed and when the votes were counted, the results showed both Goolsby and Smith were dead even with 77 votes apiece. Early voting showed 50 votes were cast for Goolsby while 43 were cast for Smith. On Election Day, Smith received 34 while Goolsby received 27. Several options were discussed as to what the city of Palestine should do to fill the council position. Ultimately, however, it was decided a run-off election would be held on Saturday, June 16. When the final ballots were cast and all the run-off votes were counted on June 16, it wasn’t even close. There were 241 people who went to the polls during the special election as opposed to the 154 people who voted in the May 5 election. Goolsby pulled in over 60 percent of the vote as she totaled 146 while Smith totaled 95. Early voting showed Goolsby garnered 116 votes as opposed to Smith’s 68. Election Day returns showed Goolsby with 30 votes while Smith had 27. As a result of the election outcome, Goolsby will be sworn-in to the District Five Council Position at the June 25 meeting of the Palestine City Council. 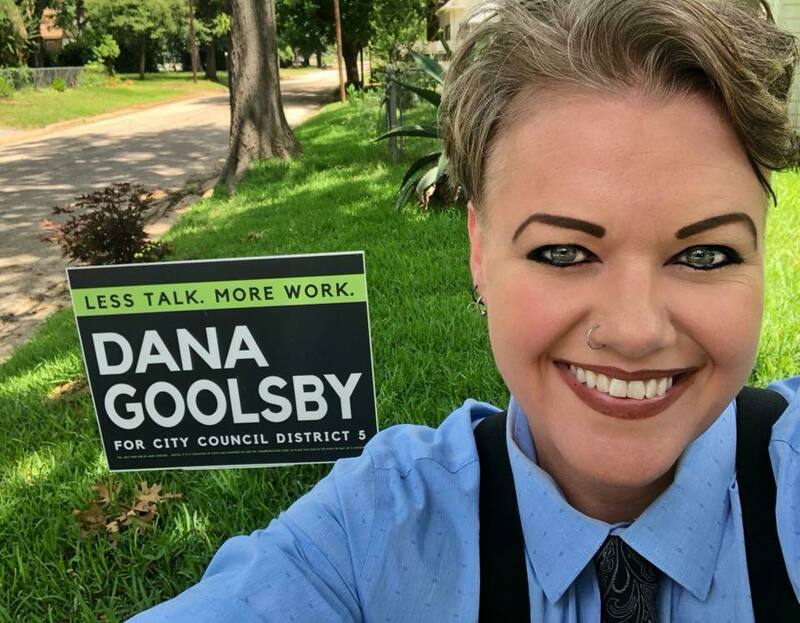 Once the dust had settled and Goolsby had time to reflect on her victory, she spoke to The Messenger about why she decided to run for office as well as what she hoped to accomplish in her new role as a member of the Palestine City Council. “I felt like there was room for improvement. I care about the community and I love living here. There are things that need to be done and I felt like this was a way to give back to a community that’s been really good to us. It is really important for me to serve and I felt like this was the best place for me to serve – a place where I could have an impact on the things the city needs,” the newly elected council member expressed. Asked what her top priorities were now that she was soon to be sworn-in, Goolsby said she would like to learn more about her position before she delineates a list of areas to be addressed, but stressed water issues and street conditions would remain a matter of importance. “Knowing that priorities could change as soon as I get in there – for me – the top two things are streets and water. Those are things Palestine needs to buckle down and do better at. Everyone has a difference of opinion, but we all drive on the same streets and we all drink the same water. That is something I can get behind and hopefully make those things better,” Goolsby explained. Staying on the topic of Palestine water, the council member-elect was asked specifically about the number of “boil water” notices issued by the city. “I know sometimes when we get a boil water notice it’s because a water main has been busted or something of that nature. I don’t know what causes every single boil water notice to appear. I do know there are some lingering issues with our water treatment facility that need to be looked at. This is one of those areas where I need to be able to see all the facts and not just what gets out through the media, social media like Facebook or just someone’s opinion,” she said. Goolsby said she had spoken to several Palestine residents who were not happy with the water quality provided by the city. “I know a lot of people are buying bottled water at this point because they don’t want to drink the water coming out of their kitchen sink. The water should be better than that. We need to make strides towards doing better,” she said. Before the discussion concluded, Goolsby was asked what she viewed as the biggest asset she brought to the city council chambers. “I am capable of doing my own independent research. I won’t be the type of person who just takes something brought before the council at face value. I will do my own independent research. I am also a great listener. Sometimes we don’t have enough people who are willing to listen compared to those who just want to buckle down because they think they have the right idea. I’m a listener and I’m a researcher. My ability to think independently – I believe – is the biggest asset I have,” she said.